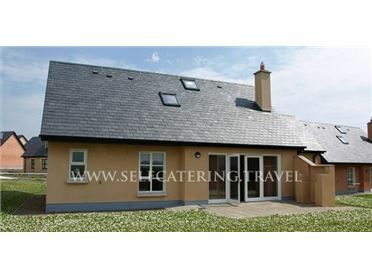 Cluny Lodge is situated near the village of Castlerea in Western Ireland. Hosting three bedrooms; two double and a twin, as well as a family bathroom, this property can sleep up to six people. Inside, you will also find a fully fitted kitchen and an open plan sitting and dining area with a wood burning stove. To the outside is off road parking for four cars, and a lawned/gravelled area to the front of the lodge, with a patio to the rear. Located in a countryside setting and close to local attractions, Cluny Lodge is a fabulous cottage in a charming part of Ireland. Castlerea is a vibrant market town, with a selection of shops, pubs and cafes. There is a nine hole golf course just outside the centre, resting amongst beautiful parkland on the banks of the river. Visit Clonallis House, a restored Victorian mansion, in charming woodland with a portfolio of history. Ballaghaderreen lies to the north of Castlerea whilst the county town of Roscommon is a short distance away. Oil fired central heating with woodburning stove. Electric oven and hob, microwave, fridge/freezer, washing machine and tumble dryer in external utility, TV with Saorview, selection of books and games. Fuel, power and starter pack for stove inc. in rent. Bed linen and towels inc. in rent. Ample off road parking. Enclosed lawned gravelled area to front and enclosed patio area to rear of property. One well-behaved dog welcome. Sorry, no smoking. Shop, pub and restaurant 4 miles. NOTE: There are a number of small steps and low doorways throughout the property, so care should be taken.